Wrestling season is still three months away, but Alta Loma’s boys team looks like it will be especially strong. Zander Silva, who spent his freshman year at Alta Loma and was a CIF-SS runner-up that year, before becoming a state placer the last two years at San Marino, is back at Alta Loma for his senior season. Silva was seventh in the state last year at 126 pounds. His San Marino teammate, Tino Lopez, was hurt for CIF last year, but as a freshman two years ago was sixth in CIF at 106 pounds. A third wrestler, Daniel Galvan, was second in CIF last year at 106 pounds as a sophomore while wrestling for Rowland. All three, who wrestled for coach T.J. Dawson prior to high school, are now at Alta Loma. Silva and Lopez have had their transfers approved while Galvan’s is still pending. High school athletes from the CIF Southern Section will jump into the pool throughout the week at Riverside City College for the 2016 swim finals. On the Division 2 girls side, Ayala’s Kenisha Liu and Redlands’ Melissa Pepper return with the hope of capping off their high school careers on top. Brandon Howell led the way for San Dimas boys swimming team in the CIFSS Division 4 Prelims. Howell earned the No. 1 overall seed going into the finals of the 200-yard individual medley following a time of 2 minutes and 1.97 seconds during the prelims. He will also compete in the Boys 100-yard freestyle finals as the No. 4 seed after posting a time of 49.03 second at the prelims. San Dimas James Hull and Jared Caldarone also qualified to compete in the 100 free consolation finals. For the girls, Alta Loma’s girls 200-yard freestyle relay team will enter as the No. 3 seed. The team is made up of Vanessa Murray, Mia Bailey, Morgan Thomas and Lindsey Whisler. Bailey will also compete as the No. 4 seed in the 500 freestyle finals following a prelim time of 5:28.72. Whisler will compete in the 50-yard freestyle finals as the No. 3 seed. She finished her prelim heat with a time of 25.23. She will also enter the 100-yard freestyle finals as the No. 6 seed. She posted a prelim time of 56.11. Most high school sports enthusiasts thought Alta Loma High School was in store for a special season in moving from the tough Baseline League to the Mt. Baldy which is a better fit demographically and from a population standpoint. Well it has been just that and there is still a long way to go. The Braves have won league titles in six sports with that run starting back in the fall with titles in girls volleyball and girls tennis. The volleyball team also made it all the way to the state championship match. This winter the school claimed titles in wrestling, girls basketball, girls water polo and girls soccer. The title in girls basketball was the first in more than three decades in that sport. The Braves were also second in boys soccer and tied for second in boys basketball. Despite moving to the new league Proctor said it also has been important to maintain the rivalries his teams have developed with its geographic rivals in the Baseline. Rancho Cucamonga has been especially willing to schedule non-league games across the boards. We’re just hitting playoffs for the winter sports but it will be up the spring sports teams to continue that momentum. The Alta Loma Braves girls water polo team won its first league championship in the program’s history following a 10-2 victory over Don Lugo in Mt. Baldy League play. Prior to the season, the Braves had set several goals in mind which included going undefeated in league and winning the Mt. Baldy League title. While the Braves fell one game short of going undefeated following the loss to Colony, 5-4, on the road, the league title was still in reach. For many of the seniors members, they are able to recall the the growth they have seen from within the program over the last few seasons. While the only goal for the Braves to accomplish this season is a CIF Title according Nesbit and he believes the only one standing in their way is themselves. The Braves will wait for the CIF pairings to be announced to determine their first game in the playoffs. The Braves end the regular season, in which they didn’t have a pool of their own, with an 19-8 overall record and a 9-1 league record. The Alta Loma Braves athletic teams have found its stride in league with both the wrestling team and the girls water polo team undefeated in league play. Alta Loma senior Kayla Cobbett has committed to the University of Great Falls over the winter break, where she will continue her soccer career. Cobbett, who had offers from other programs, took a visit to UGF back in September. Cobbett expressed that the team’s recent improvement shows how hard they have been working and it was something she was excited to be a part of. Cobbett knows what improvements she needs to make to her game to compete for a starting spot at the next level. 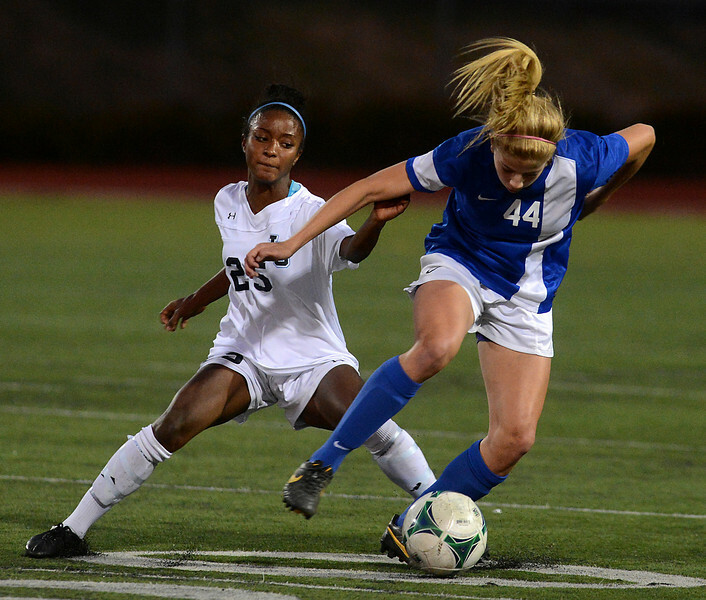 Alta Loma senior soccer standout Leah Pruitt was widely considered the top player in the area – hands down. The Braves (13-4) were ranked No. 1 in Division 5 and looked like they were going to cruise to a CIF title and be a threat in the state portion of the playoffs as well. But all of that is in jeopardy now as Pruitt sustained a knee injury against Montclair last week that will sideline her six to eight weeks, according to coach Ben Davies. She sustained the injury against Montclair and missed the next game against Colony which the Braves lost 4-3. Freshman Ashlyn Favoro will get the bulk of the playing time in Pruitt’s absence. Making the timing even worse, Pruitt was one goal short of the school’s single scoring record of 37 goals. She had 36, with two already in that game against Montclair. That injury is a real shame. Pruitt, who has committed to San Diego State, was a great player to watch and I am told by many people, an even better kid. Now it’s up to Davies to rally his troop. Long-time Alta Loma High School Athletic Director Brett Proctor has been named state athletic director of the year. The honor came at a winter meeting of the California State Athletic Director’s Association over the weekend in Reno, Nev.
Proctor started out as girls athletic director in 1992 and was tabbed had of both boys and girls in 2000. He is the fifth representative from the Foothill-Citrus Athletic Director’s Association to be so honored. The others were Jim Drake (Upland), Steve Martin (Ayala), Ray Moore (Diamond Bar) and Toki Ochi (La Puente Bassett).